Home / Fragrance / Perfumes that bring home the rains… forever! 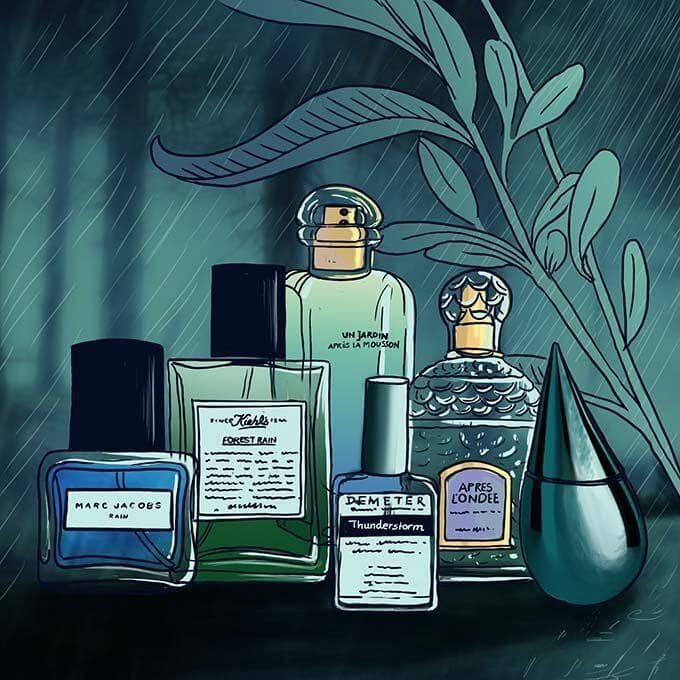 Perfumes that bring home the rains… forever! To me, there is nothing more beautiful than the first rain showers of the season. There is something so magical about the rain – especially as you sit on the edge of the seas, watching the sparkling raindrops fall from the distant skies above onto the sheets of water below, the breeze picking up and swirling away all the summer dust. I love how everything seems so fresh and clean and sparkly – there is quite nothing like the smell of fresh rain on the summer-scorched earth and the sight of stately trees turning green again. As for the jagged flashes of lightning that cut through stormy night skies – neither nature, nor humans have yet to recreate better theatre. This is the time to sit on an open terrace, drinking jasmine tea (or a turmeric latte) and eating onion fritters. Or maybe sipping a tall flute of chilled Prosecco and feasting on olives and parmesan as nature plays out its most amazing spectacle. Touching and feeling the raindrops on your skin, hearing the wind and thunder swirling around in abandon and seeing a bright summer afternoon transform into a dark and shadowy twilight zone. This is the time to be on your own, with your own thoughts – not amidst the clamour of crowds. It’s the time to reflect, to clear your mind, to resolve the past and plan the future. It’s the time to let the rain showers clear away those innermost cobwebs just as they are wiping the slate clean for nature’s panorama. It’s definitely not the time to worry about your clothes getting wet. Or your mascara flowing away. Or even your hair frizzing to double its size. There are enough days in the year when we need to worry about our style quotient… let monsoon be the time out when you can just be yourself. 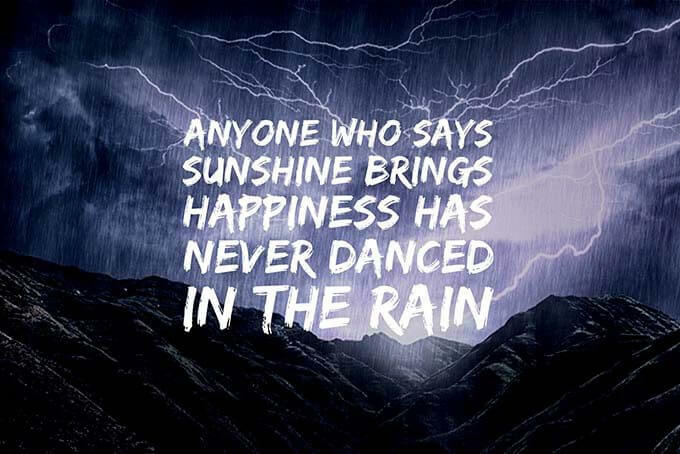 When you want to dance through the rains as they soak right through to the skin. When you laugh with abandon and experience the pure, unadulterated joy of being one with nature and not having a care in the world. Unfortunately, those blissful days are still a while away and we still need to get through the scorching summer in the meantime. Which I am going to do by drenching myself in a rain-inspired perfume… if I can’t have the storms and the thunder, at least I can envelop myself in a fragrant cocoon that blocks out the heat. For Rain Splash, Marc Jacobs was inspired by the smell of a city after it rains. With notes of wet grass, clementine, dewy cypress, sparkling wild strawberry, white orchid, beech amber, tree moss, musk, teakwood and a rain accord, the perfume seems both green and humid with just enough sweetness to keep it fresh. This spicy, woody perfume takes us to a mountain forest covered in rain with its combination of bitter citruses, lily of the valley, vetiver, cypress and musk. It’s cool, breezy, earthy and sensual – just like the ground surrounding a forest of leafy coniferous trees that’s just been washed by the rains after a long summer. Un Jardin Après La Mousson (“Garden After Monsoon”) is Hermès’ in-house perfumer Jean-Claude Ellena’s love song to Kerala, one of India’s most lushly gorgeous regions. A delicate, soaring arrangements in cool shades, the sheer, almost-ethereal fragrance opens up on the coolness of cardamom and the crisp fruitiness of watermelon. Then emerge the floral-woody notes of pepper, ginger, ginger flower and vetiver accord, creating an overall impression of a delicately spiced citrus – to visualise, picture a large bowl of sliced watermelons, then add fresh mint, lime juice, freshly powdered cardamom and small slivers of crystallized ginger. Pure bliss! Demeter is one of those boutique brands that take a bit of hunting to discover but once you do try it out, you will be hooked for life. Thunderstorm is extraordinarily evocative in its ability to call up a rain storm, complete with the sparkling across-the-sky lightning and humidity hanging heavy in the air. Then comes the aromas that surround you after the storm has passed: Wet leaves, water-soaked earth and a sense of rain drying on a hot pavement. Sometimes life is that simple! Apres l’Onde (French for “After the Rain Shower”) is a Belle Époque creation, dating back to 1906. The passage of more than a century has done nothing to dull the composition’s graceful symphony, which marries the era’s sparkling joie de vivre with it’s equally signature undertones of brooding darkness. An opulent composition that radiates with notes of violet, iris, hawthorn, vanilla, anise and carnation, it speaks of a fresh, sparkling new world that’s been recently swept clean by a rain storm. Beautiful. The perfectly sculpted raindrop form holds a fragrance that’s redolent with rare roots, herbs and flowers from across the world, including Thai anise seed, crushed Moroccan coriander, Moroccan red rose petal, Chinese star magnolia, night blooming Indian jasmine, Indonesian patchouli leaves, red sandalwood, Venezuelan tonka bean, rare agar wood, rich musks and warm vanilla. The result? A fragrance inspired by a phenomenon that takes place in the Swiss Alps, where falling rain transforms into ice crystals (“the silver rain”). « Chillies and vodka… for longer, stronger hair?